I’ve talked a lot about my grandmother, Barbara, on this site. She, along with my mother, taught me a lot of what I know about cooking, and she taught me most of what I know about southern cooking. After my parents divorced and we moved closer to her, I spent a lot of time with her as my parents were trying to get back on their feet. I was fascinated with her stories, I loved eating her food, and she was an amazing stabilizer for me in a time when my world was going crazy. I asked my father to tell me what he thought his mother’s “favorite recipe” was. I was thinking of doing mountain pie for her recipe, because that is my favorite thing that she cooked. But, I decided to ask my father because well, he had 26 more years of experience with her than I did. I guess, however, that the tendency to impose our own favorites on people who can no longer speak for themselves is human nature. I have no idea what my grandmother would have said, but my father suggested that I make his favorite recipe of her’s, her smothered pork chops. If you remember, I made my own version of this recipe a few months ago. I loved it when my grandmother made it, and I love it when my father makes it, so I consider it to be a good choice. I didn’t read through the recipe again before I went grocery shopping, so I came home with green onions and a shallot where my father had said green pepper and onion. The grocery store also only had boneless pork chops, so I had to make due with that. 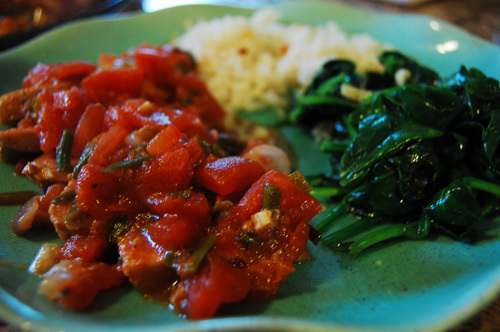 Traditionally my grandmother served this with a side of white rice and spinach soaked in vinegar. In my years away from home I have become much more partial to spinach tossed in olive oil and garlic, so I made that instead. I made jasmine rice, and stirred in butter, red pepper flakes, and salt and pepper. And boy was the whole thing delicious. For this recipe, my father and grandmother always used a cast iron skillet, because it gives the pork a nice crispy skin. And even though you end up simmering it all together, the starter skin is still important in the overall texture. 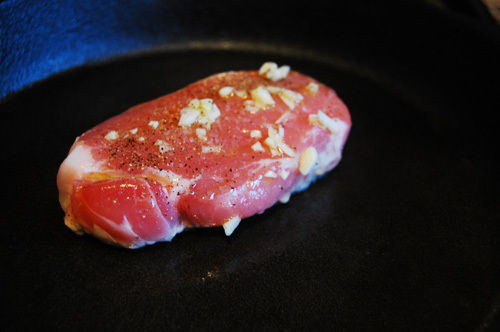 Begin by rubbing each side of your chop with garlic (1 clove, chopped) salt and pepper, and one tbsp olive oil. Heat up your cast iron pan with another tbsp, and get them going. You want to cook the chops for 5-7 minutes on each side, so while it’s cooking you can dice the shallots and green onion. 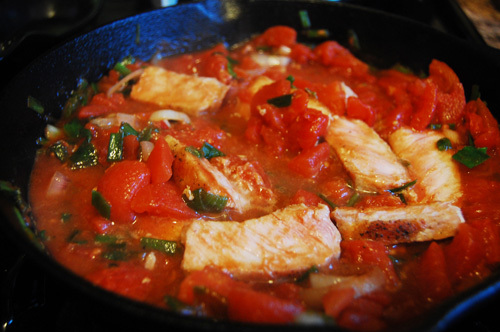 When the pork is done, add the onion, shallot, and tomato to the pan. Reduce the heat and simmer for about an hour, stirring occasionally. About five minutes before you’re ready to eat, heat the remaining 2 tbsp olive oil in a separate pan. Chop the other clove of garlic and begin to sauté it. A handful at a time, add your fresh spinach. 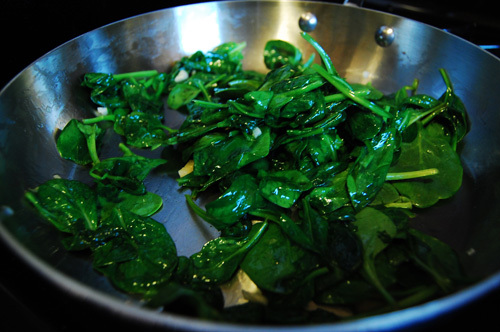 Use a pair of tongs to turn the spinach until it has all wilted. Let it simmer in its juices for no more than a minute, and serve. Serve with saffron or white rice.